Partner with Love Is Blooming to design the wedding of your dreams with our pre-designed silk flower bouquets and boutonnieres available for sale. We can help your wedding bouquet vision a reality by taking the designs you like and designing your silk wedding flowers. Visit our Etsy shop for more information about each piece and to purchase. Our wedding bouquet and boutonniere sets are perfect for destination weddings, intimate gatherings, or vow renewals. 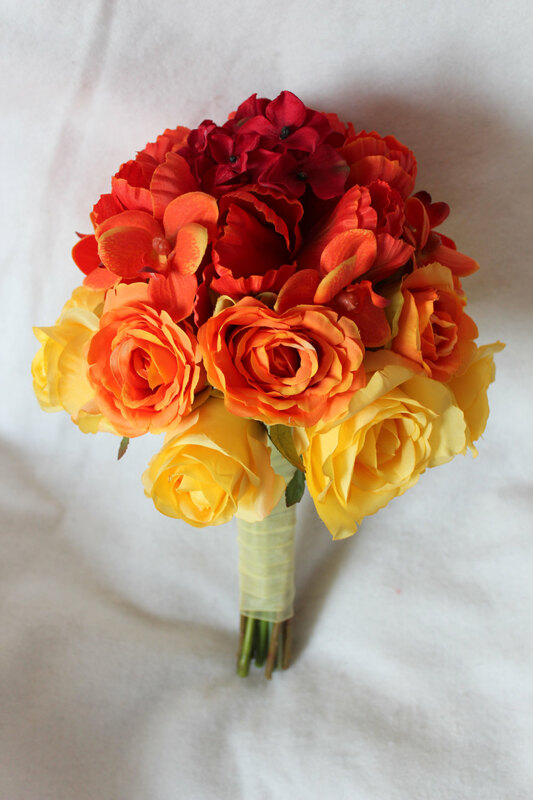 Start with our pre-designed silk-wedding bouquets or order a custom design to match your colors. Our beautiful wedding bouquets will wow your guests and look amazing on your special. Each item is handmade and unique. Materials include high-quality silk flowers, ribbon, feathers, and decorations. Love Is Blooming only ships within the United States. Handmade with high quality silk flowers, dried craspedia, pheasant feathers, satin ribbon, twine, metal keys, and artificial berries. Handmade with high quality silk flowers, rhinestone wrap, and sheer ribbon. Handmade with high quality silk flowers and satin ribbon. 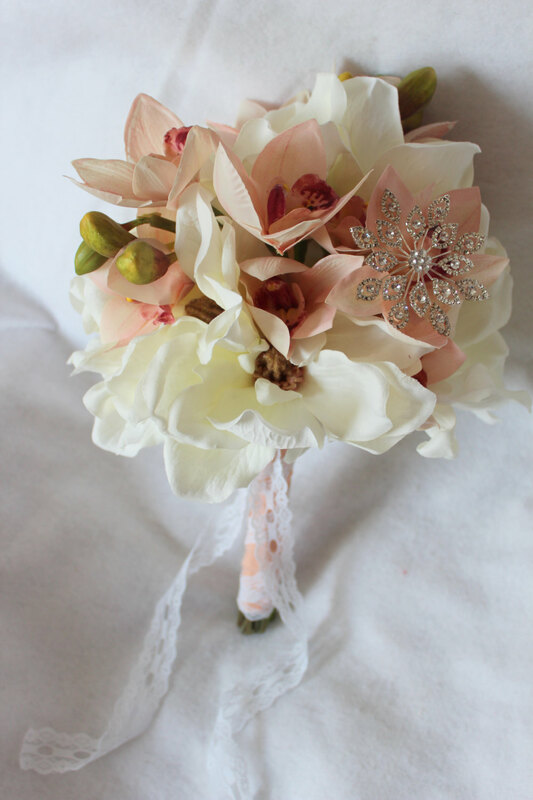 Handmade with high quality silk flowers, fresh touch flowers, muslin, lace, and a rhinestone bouquet jewel. Handmade with high quality silk flowers, sheer ribbon and a bouquet buckle. Handmade with high quality silk flowers, satin ribbon, and buttons. Handmade with high quality silk flowers, burlap and lace. Handmade with high quality silk flowers, fresh touch silk flowers, ribbon and beaded wire. Handmade with high quality silk flowers and sheer ribbon. Find a style that will complement your wedding dress and your personality. A petite bride may look overpowered by a large bridal bouquet and a tall bride may look underdone with a small bridal bouquet. Your wedding flowers don't always have to be the colors of your bridesmaid dresses. 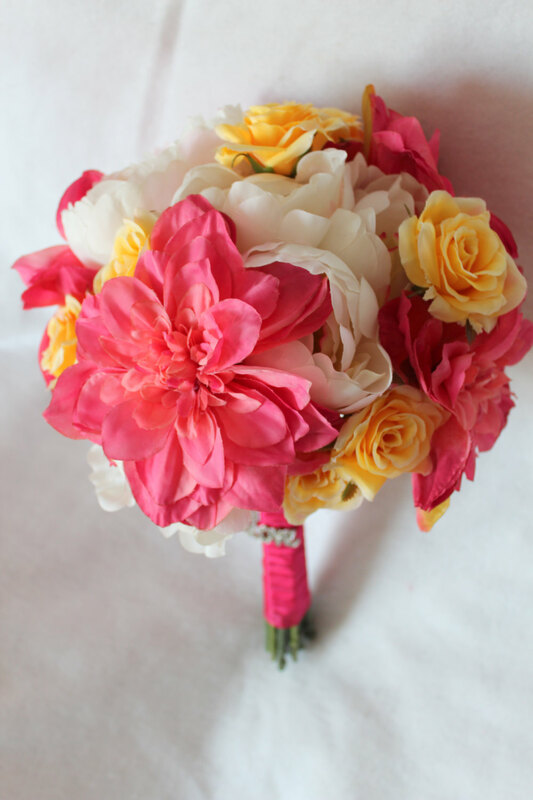 For example a bright, multicolored bridal or bridesmaid bouquet makes a great statement at a Spring or Summer wedding. The bridal bouquet and groom's boutonniere will be crafted from the same high quality flowers. Another great way to share your special day together. Complement your bridal bouquet with a smaller matching bridesmaid bouquets for your girls, or go for something completely different in style or color. Either way, their beautiful silk flower bridesmaid bouquet will be a lasting reminder of your friendship. Choose a corsage for the important ladies in your life according to their dress, personality, relationship or to match your designer silk bridal bouquet. Remember, those with sensitive skin may not wish to have a wrist corsage. With silk flowers, you never have to worry about a pinned corsage staining clothes or getting ruined by hugs. Most wedding planners suggest assigning 10% or more of your wedding budget for flowers. Keep in mind that, your dress and your flowers are the two things that will be in almost all of your pictures. With silk wedding flowers, your flowers can be displayed as a permanent reminder of your spectacular day.